I bought my BD in Oct'09 and have slowly been incorporating it in my life to replace car trips when and where ever possible. I also use it to take 2 of my 3 kids for rides--last Thanksgiving, I took my 2 daughters to my sister's house instead of driving there (~4 miles one way). 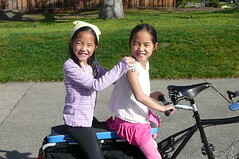 They love the bike and its name! 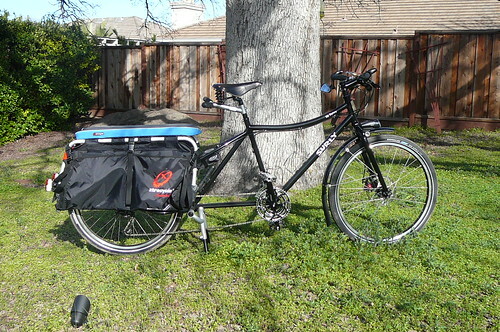 Many thanks to Dave of Cycle City in Alameda, CA, for great tips and advice on the BD. After talking with Dave and the nice folks at Cycle City, I know I'll be investing soon in a set of wideloaders and whatchamacollars. Photo courtesy Bob Gong, Granite Bay, CA. You meet the nicest people on Xtracycles. I think it's cool how cargo bikes inspire dads to spend even more time with their kids.